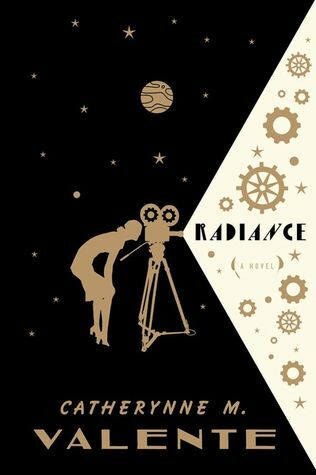 Formally innovative and stylistically daring, Radiance by Catherynne M. Valente takes a lot of risks in its pursuit of slowly revealing a mystery among the stars, or at least among the planets of our solar system. Imagined here with the wonder and improbability of early film where the moon was a short drive away and where every planet was home to different delights, the novel mixes texts, compiles sources surrounding the disappearance of an entire settlement and the disappearance of one woman, Severin Unck, a woman whose entire life has revolved around making movies. From the earliest age she was captured on film by her father, a director of ridiculous (though awesome-sounding) gothic horrors. The form the novel takes makes for a book that I found a little difficult to pierce, at first. This is not a traditional structure, but it quickly establishes its game and by the end I was enthralled by the mosaic it created. Severin becomes both the star of the story and it's greatest absence. She's a young woman striving to throw off the past, to make something for herself free of the fame that has followed her because of her father. She's someone who wants to be an artist and wants to do something meaningful and wants so many things, perhaps most of all to figure herself out. Her past is revealed in home movies, through her own exploits as a director, through the accounts of her friends, family, and lovers. What truly happened to her…well, the book does an amazing job of building that mystery, of showing the people left behind trying to make sense of it. Perhaps most telling and shocking is the project of her father to make a movie about her life and about her disappearance. To make sense of it. The book is full of magic. Movie magic, I suppose, but magic all the same, and a nostalgic gleam over the solar system. These are the worlds as people imagined them, hanging up in the sky like foreign countries, no further away than China is to Europe. The planets are hilariously drawn up along national lines, Mars belonging to Russia and China, Pluto to America, Venus open to all because it is home to the callowhales, creatures whose "milk" is what allows humans to travel between worlds, providing all the nutrients they could ever need. And this early SF vision of the solar system cast as an alternate past is striking and quite charming. I fell in love with the romantic vision of it colliding with the dirty, often violent and chaotic reality. And I think the book does a great job of exploring that space where the movie magic meets reality. Where even the magic of this alternate universe cannot cover the oppression and the exploitation going on. The riots and the extremes of the planets are only touched upon, after all, and yet those small caresses are enough to show that beneath the Hollywood glamour there is something dark and deadly. The secret of the callowhales is not one unique to the fictive world of the book, after all. That exploration often walks hand in hand with enslavement, with not only a lack of empathy or understanding but a conscious rejection of it in favor of something that seems so easy, so right. The mindset of the imperialist insisting his actions just because some sort of God does not put a stop to them. And here we see an extension of that. Of course in the visions of early SF the planets are either virgin land waiting for us or else populated by monsters the brave Earthmen must subdue. This is captured brilliantly in the art seen within the novel, and the glimpses at the film plots and the radio serials are great, funny and depressing at the same time, because they promote a vision of the solar system that is much simpler than it is. Easy for advertisers to spin callowhales as the cows of space, but it becomes increasingly clear that's not the case, in the growing desperation of Severin's father, Percival, to explain what happened to her. It's telling of the craft of the novel that it can build so tightly to its climax using only found texts, bits and pieces of movies and scripts and recorded conversations. There is an air of authenticity this lends the novel, in good Gothic tradition, but it also plays with the idea of texts and truth, asking what is most true out of all of them, the texts that profess to be true or those sold as fiction. In the end the novel captures the feeling of a time when space was full of new countries to explore. The setting is beautifully rendered even as it creates a dark and muddy place where the only things black and white are the movies. Life is not so simple, filled with shades and colors and luminance. It's a dense novel, challenging but rewarding and very, very good. Nerd Coefficient: 9/10 "like looking into a callowhale's eye" see our full rating system here.